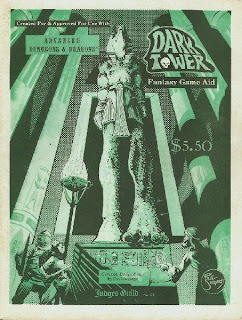 Along with Tegel Manor (by Bob Bledsaw) and his earlier Caverns of Thracia, Paul Jaquays' Dark Tower is probably one of the most famous and well loved adventure modules ever produced by Judges Guild. So great is its reputation that it even made Dungeon's "30 Greatest D&D Adventures of All Time," the sole non-TSR/WotC product to appear on a list that, by my lights, was filled with lots of self-congratulatory nods to modules of little lasting import. As I said in commenting on the Dungeon list, I think 1979's Dark Tower certainly deserves to be on Top 30 list, as, like most of Jaquays' work, it's masterfully done. I personally don't consider it his best -- I prefer Caverns of Thracia -- but there's no arguing that it's a brilliant piece of work. It's also noteworthy because it's an AD&D module rather than a OD&D one, which only makes sense given its late date. At this point in time, Judges Guild still held a license from TSR to produce official support products for their games and AD&D was the "rising star" in TSR's stable. Mechanically, though, this makes little difference, because, with a few small exceptions here and there, it's perfectly usable with OD&D and I suspect many people used it in such a fashion. The module itself concerns the town of Mitra's Fist, formerly the hermitage of its namesake before he achieved apotheosis as one of the greatest gods of Law and Goodness. During his mortal existence, Mitra opposed the serpent-demon Set, who himself achieved divine status and sought revenge on his rival by creating a dark tower in Mitra's Fist, out of which poured his minions, who destroyed the town, its inhabitants, and, most importantly, the priesthood of Mitra who tended to the shrine of their deity's ascension here. Of course, over time, treasure seekers returned to Mitra's Fist, under the watchful eye of the clerics of Mitra, hoping to uncover some of the lost treasures buried in the rubble of the town. Unfortunately, in doing so, they have awakened the ancient evil of Set's dark tower and, unless someone acts to defeat it, history may repeat itself. The dungeons consist of four levels that represent the buried ruins of Mitra's Fist, plus the eponymous Dark Tower and the Tower of Mitra, both of which were also buried when Set's minions destroyed the town. These areas contain a good mix of encounters, tricks, traps, and oddities. In addition, as one might expect from a Jaquays module, there are various antagonistic factions with which the PCs must interact, the results of which affect their progress in exploring the dungeons. Fascinatingly, the possibility of evil PCs aligned with Set is noted and there are even rules for the bonuses clerics of that god get while in areas dedicated to their deity (the same is true for clerics of Mitra). Dark Tower has a lot to recommend it, chiefly its open-endedness. While not as large a complex as Caverns of Thracia, there's plenty to do here and, beyond the basic background that gives context to the whole place, there's no plot or purpose to get in the way of some good old fashioned dungeon crawling. The module is tough and unforgiving. It assumes a party of 6-10 characters of level 7-11; anything less than that I expect it could easily turn into a bloodbath in a few places. I understand this module was re-released under the 3e rules, but I've never seen a copy. If anyone has any experience with it, I'd love to know what it's like. Actually, there were 2 newer forms produced. One just as 3e was getting started and other done by Judges Guild (revamped under Necromancer Games) in collaboration with Goodman Games. The major changes appear to be correcting misspellings and updating stats. Otherwise, it's the same great adventure. The module is a very good Gloranthan dungeoncrawl. It uses very well Gloranthan races and cults to create interesting factions in the abandoned Duck temple of Humakt. Paul Jacquays is one of the giants of old school RuneQuest. Did I ever mention his wondeful sandbox campaign Griffin Mountain? Ah, one of my favorites, and one of my favorite "comfort reads." It was part of my bathroom reading pile for years. I think I ran games in it twice, but the one I remember details about was running it for several of my players in a booth at the Venice High School carnival (I was on the football team so we didn't get jumped and beat up later). I let them start characters at 8th level, and I think by the end of the day I had gotten about a dozen observers into gaming. And man o man, Griffin mountain was an amazing piece of work. It oozed outdoor atmosphere. Paul J. was my gaming hero as a kid. ". . . there's no plot or purpose . . ."
This is an interesting choice of words (and one that says more about the blogger than the product, I suspect). I suppose my reaction to that phrase is to be blamed on my present location in a marketing department. If I were pitching the module, or trying to convince an audience of its value, I would not state outright that it had no plot or purpose, even if this were the case. Now, I understand that your intent is to shine upon the module a light that will reveal its old-school goodness, but sometimes the grognards among us fall back on fundamentalism to the extent where "plot" becomes a curse word. In response to the extremely railroady Dragonlance plotlines, we deem all modules with "story" to be inherently bad, when actually, a GM should have little difficulty removing the story framework from most of these modules and still providing his or her players with an engaging game. Okay, so now I'm rambling, but I feel as if we get a bit reactionary at times, and this is reflected in the language we use when comparing the best "style" of our favorite game. Here's my silly analogy for the day: 1st Edition is like Van Halen with David Lee Roth; devoid of synthesizers, their rock was pure. 2nd Edition is the same band with Sammy Hagar; much more radio-friendly, they scored a lot of hits, but left the old guard grinding their teeth and wondering why their band had to ruin itself by becoming popular. I do enjoy this blog. Just don't tell my boss that I spend part of every morning reading it . . . I already have a printout of the 3e version, also from rpgnow. I'll compare the two. I previously compared the original and 3e versions of Thieves of Fortress Badabaskor; the 3e version suffered IMO from 3e stats giving excessively powerful monsters, and I've already seen this in Dark Tower 3e (in the wandering monster list, CR 1/2 skeletons sit alongside CR 16 Son of Set!). The 3e background notes also seemed different and not nearly as good as what you describe; which was the way with Badabaskor too. Partly it was squeezing it into Necromancer's version of the Wilderlands timeline. Partly I guess a modern idea that gods should be far further above PCs than in the old material. Hot damn! Finally an analogy that we less intellectual grognards can grok! "...I'm at seaside sittin' just a smokin' and a drinkin' on ringsinde, on top of the world, ahhhh yeahhhh..."
Sure, but those synthesizers in 1984 were one of the signals that the times were changing. Dave left after that album. There were similar signs when TSR started making a transition. For a rather goofy analogy, I think it holds up. Interesting comparison between the originals and the 3e versions, S'mon. Thanks. Did I ever mention his wondeful sandbox campaign Griffin Mountain? You have and I keep thinking I need to grab a copy of it for myself. I've seen it and read through parts of it, but have never owned it myself. I think I ought to rectify this situation at some point. Rectification at the soonest opportunity is strongly recommended. My own original is in sad shape, and the Moon Designs edition is something I'm considering. Pulp Fantasy Library: Who Fears the Devil?